This dignified beggar, let's call him Alfie, stands under a clear and luminous sky. He has a clubfoot (a deformity) and holds a paper that authorizes him to beg. You kinda needed this in the 1600s, around the time Shakespeare wrote Hamlet, Massachusetts was created and the Taj Mahal was built. The paper says, "Give me alms for the love of God." Alfie's also mute (because he shows the paper instead of talking). He's happy having his portrait done. The dignity shown comes from the view being close to ground, making Alfie look bigger. This type of painting, called "low-life", was popular as it fed off the Christian ethic of supposedly respect for the poor. Churches and rich people adorned their walls with these. This is how how Italians did it. The Flemish (from the Holland/Belgium area) also did this kind of work but their painting can be disrespectful of their subjects. The painting was actually commissioned by a Flemish art dealer. Jusepe ("Joey"), the painter, was Spanish but lived mostly in Italy and his paintings show the influence of both worlds. He first lived with followers of Caravaggio in Rome. Caravaggio was famous for using dramatic, high contrast lighting called chiaroscuro, for mannerism, where people were slightly elongated and twisted for artistic emphasis, and for baroque art where things had lots of detail. Joey then moved to Naples, where he became the most famous painter, mostly working on religious stuff. 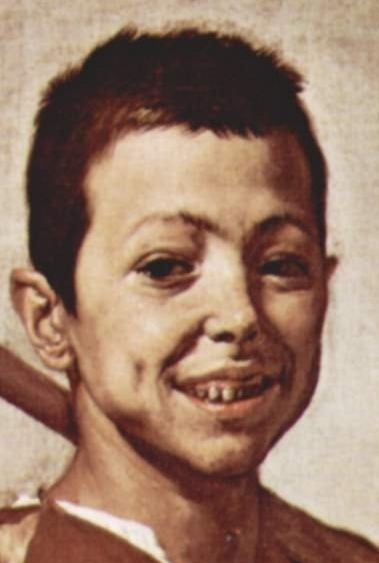 Joey did such a great job with this painting and made it so realistic that a modern doctor diagnosed the beggar as having cerebral palsy, not a clubfoot. The doctor waived his fee because the clubfoot guy had no health insurance*. Fun fact: The original title was The Dwarf before the Louvre got it. and changed it to The Clubfoot. Well, not really fun. But a fact. Just for fun. 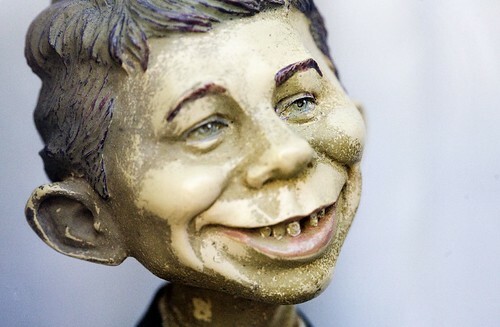 Strangely, the clubfoot guy's face looks like Alfred E. Neuman, the icon of MAD Comics. Alf says "What, me worry?" Mr. Clubfoot never did.